Schaumburg, IL – July 25, 2018 – In the three and one-half years since starting production, INX International’s solvent packaging ink facility in Lebanon, Ohio has achieved a number of impressive results. After experiencing tremendous growth in that segment and the recent huge success with the relocation of its digital inkjet production, company officials are considering expanding the building and workforce in 2019 to support future solvent ink growth. INX completed the move of all digital inkjet ink product lines from the Dixon, California plant to Lebanon in December 2017. Equipment and several key employees were part of the transition. The facility is on goal to manufacture 1.6 million pounds of digital ink this year and is projected to increase to 2 million pounds in 2019. However, expected future growth will not only impact Lebanon but manufacturing facilities in Dunkirk, New York and Appleton, Wisconsin. “The entire digital manufacturing transfer project to Lebanon, as well as the introduction of digital manufacturing in our Dunkirk facility, has been supported by Sakata INX Research & Development and INX R&D, Operations and Sales here in the U.S.,” remarked John Hrdlick, President and COO. According to Jim Kochanny, Director of Liquid Operations in Lebanon, solvent packaging ink production at the facility has increased to 2.5 million pounds monthly. In 2019, it is expected to rise to 3 million pounds per month. The success Lebanon has experienced is due to years of planning. The state-of-the-art, 63,000 square-foot building sits on 11 acres of property and replaced a smaller operation in Cincinnati. Employing over 60 people and involved in the local community, the manufacturing group was selected as the 2017 Industrial Business of the Year by the Lebanon City Council. Planning for the shift of digital inkjet manufacturing from Dixon began in September 2016, says Heidi Dudley, Director of U.S. Digital Manufacturing, who has been with INX for 14 years. She, along with Quality Control Manager Jose Angel and Lead Quality Control Technician Mathis Gardner, made the move and oversaw the transfer of all product lines, from clear coat to UV. Hrdlick said INX originally invested $22 million to make Lebanon a cutting edge facility and another $1.5 million in equipment for digital ink manufacturing. It was also designed with the best safeguards for a safe working environment, and safety training has been a top priority from the beginning. These efforts have contributed to the building’s success. “Automated manufacturing has had the largest impact in Lebanon,” continued Dudley, “with more efficient equipment utilizing computer programming to monitor and maintain the desired specifications. This allows for a controlled energy cost per pound and increased pound per man-hour at the facility. The same technology is being used for digital manufacturing. 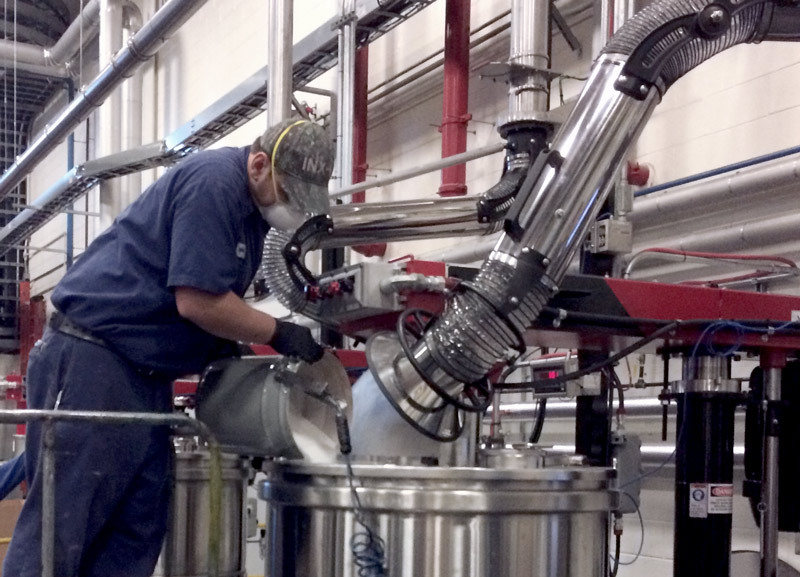 Ink maker Kristopher Ray works on one of ink mixer machines at the INX manufacturing facility in Lebanon, Ohio. Safety has been a top priority since the building opened in 2015. Dudley said another advantage of Lebanon is its location. It has easy access to nearby Interstate 71, as well as other major east-west and north-south routes. With the Dunkirk, New York plant contributing, Hrdlick says INX is well positioned for continued digital growth.